The Biospec Products Mini Beadbeater provides consistent and efficient processing of small samples, from 100µL to 1µL, to disrupt bacteria, plant, and animal cells in just 2-5 minutes. This homogenizer uses a cracking action rather than a high shear, for a non-foaming, non-aerosol that preserves enzymes, nucleic acid and organelles. 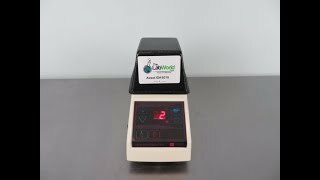 The operation of this bead beater homogenizer is simple and straight forward, with icon based navigation, letting users select their speeds and time, from 2500, 4200, 4600, or 5000 rpm and between 0 to 5 minutes in 10-second increments.